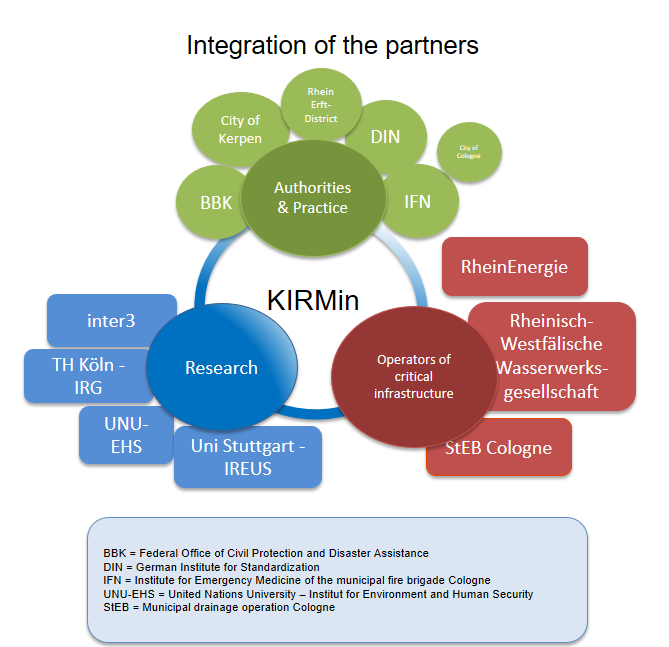 The expertise of the project partners Cologne University of Technology – Institute for Rescue Engineering and Emergency Response (TH Köln IRG), Federal Office for Civil Protection and Disaster Assistance (BBK), United Nations University – Institute for Environment and Human Security (UNU-EHS), inter3 – Institute for Resource Management as well as the Institute for Spatial Planning and Development Planning of the University of Stuttgart (IREUS) will link innovative research with practical solutions to societal challenges. The approach cultivated in the project is participatory and the dialogue between actors in science and practice, but also between the individual partners in practice, is particularly noteworthy. Thus an exchange between different operators of different critical infrastructures, authorities and organisations with security tasks (BOS), the population and science is promoted. The project thus presents a coherent communication strategy and new forms of participation and knowledge management, especially in direct contact between end users at workshops. The project pursues the goal of involving relevant actors and permanently optimising them through continuous feedback on developed solution proposals.